Installing a chain link fence is one of the quickest and most cost-effective ways to improve the security of your property. Whether you’re looking for commercial fencing or a reasonably-priced fence for your back yard, chain link fence is a terrific alternative to wood and iron fencing. Installing commercial fencing on your property provides you with an efficient way to limit access to certain areas of a build site, or to section off areas from the public, too. ⇨ Comes in a variety of styles, including color-coated, varying thickness and styles. ⇨ Select from a sliding gate or a swinging gate of custom width. ⇨ These durable and adaptable fences require little to no maintenance and can last for many years. ⇨ Chain link costs significantly less than other types of fencing that provide similar security levels. ⇨ Professional installation of a chain link fence goes very quickly. ⇨ Damaging winds are unlikely to damage a chain link fence due to the open weave. ⇨ They offer a high level of visibility, and come in a variety of different heights based on your needs. 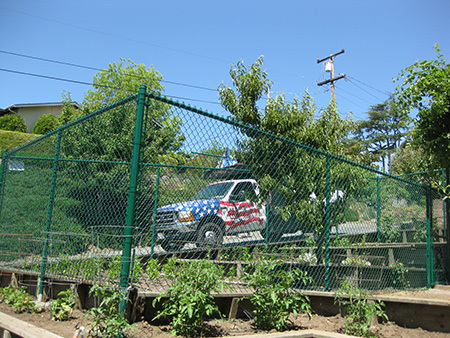 When you need commercial fencing, consider chain link from All American Fence. Our professionals are ready to answer your questions and provide you with a free initial estimate. Give us a call at 925-743-8583 any time or request a free estimate online.